Recently the on-site health and safety police visited our work premises. They highlighted some of the more dangerous areas of our everyday practices. This device was cited as a potential risk due to an inadequate warning label. This scribble was published on Thursday, December 9th, 2010. You can follow any banter on this scribble with the RSS 2.0 feed. You can share your inspired musings after typing the anti spam word near the bottom of the page. But no Pinging because its too naughty. Brilliant! Can you send them over to our office please? Someone brought a heater in from home to install. An email went around the office within an hour saying any electrical equipment brought from home must not be used unless it was PAT tested. Said person read the email, reached down and patted the heater affectionately a couple of times before returning to their work. Priceless. 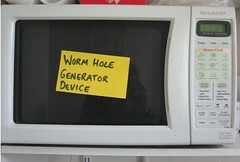 we were very glad it wasn’t a ‘rathole generator’ because staff can get lost down ratholes. Wendy there appears to be a problem with the feed to blogger and I wasn’t getting any notifications of your blogs…now there is a wormhole if ever I experienced one. Elf n Santa Safety would not know where to start in our place!